In honor of the Great Backyard Bird Count that's still underway, I had these lovelies pointed out to me from the great website Rare Device. I have an allergic reaction to cuteness I swear, so these things are safe for me to be around. I get it that I have some ideas about what constitutes an objet d'art that are specific to me. I get it. With that said I can't think of a cooler objet to set on the corner of my living room bookcase. I love birds so that's covered, I love cast metal and that's covered too. They're perfect! Rare Device has scores of other one-of-a-kind artistically minded pieces. Think of it as Etsy without all of the cheesy, crafty stuff. You should check them out. Paul... thanks so much for your terrific and positive comments about the fireplace reface I designed for Kate. I'll definitly pull together a post about how the facade was built. I hope you'll drop by in the next few days to read it! 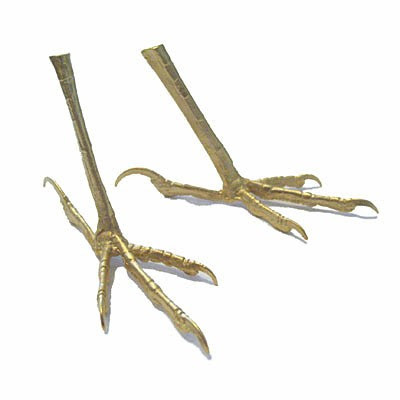 Now those bird feet seem like a perfect accompaniment to an Easter place setting now that I'm thinking about it. It's my pleasure Victoria, that fireplace is really stunning and I can't wait to see your post on its construction. I subscribe to you guys now so I'll get it when it's still hot off the press.